The Patriot Guard Riders have shared photos showing the respect with which SSGT Morris was received home and laid to rest. The Morris family wishes to share them in Daniel's honor. 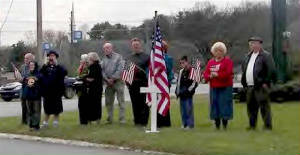 The war came home to Clinton, Tennessee on Saturday, Dec 2 when the community gathered to pay it's respects to a fallen soldier, one of their own, Staff Sgt. Daniel Marshall Morris. "You never think they'll come home like this," Sue Fox, a long time neighbor and family friend, said. She watched Morris grow up. "You hear news about the war and it's all like a dream until you see the casket. Then you know. It's finally hit home." SSGT Morris had planned to come home and become a minister. Now he's back but not in the way family had hoped. He died last Saturday, when a road side bomb exploded near his Humvee in Diyala, Iraq. Two other soldiers were injured in that incident. More than 800 people; family, friends, and others who'd never even met SSGT Morris filed through The Holley Gamble Funeral Home during the visitation to say their good-byes to Morris. He was their hometown boy, the one who grew up dreaming of being a soldier; the one who became a soldier of the highest caliber, and the one who gave his life for his country. Just before his death, Morris wrote home, "God has been good to me, so you don't have to worry." SSGT Morris lived at the New Testament Servicemen's Home near Ft. Hood, Texas. Rev. Matthew Reed, Morris' pastor, said that Morris loved serving his country. He knew Morris as a friend with dedication to his job and love for the mountains of East Tennessee. Pastor Reed went on to say that "Everything he did, he did with his whole heart. When you live with the soldiers, you always get close to them, and there is always someone special. Daniel was that special one. You could see the gleam in his eye when he talked about Alexys, his daughter. When he put on that uniform, he became Superman. I'm a better man today because I knew Daniel Morris." The crowd who gathered to honor and mourn SSGT Morris recalled memories of the quiet, soft-spoken boy who loved football, the outdoors, Krystal chicken sandwiches and his home in the Wolfe Valley community. "He made everyone smile." "When anyone got hurt playing football, Daniel was always the first one there to help them." "Every time you were with him, you had a good time" said Allen Silcox who grew up with Morris. "Fishing, hunting, and playing sports in high school; they were all good times." The flag outside the funeral home stood at half-mast, while members of the Patriot Guard somberly stood outside the funeral home, proudly holding flags. They came from all over Tennessee. Many, like Duane Romine, had never met Morris. "I'm here to show my support to the family and to the soldier who gave his life for us," Romine said. Romine said he attends funerals for soldiers because they died to protect his freedom. "I owe something back to these individuals. That's allowed me to be able to travel these streets and not feel threatened by terrorists." Romine has already attended eight military and police funerals in Tennessee since July. He says each one stays with him. "Basically, a part of me goes with that individual. I never forget them. I know each of them by name. " 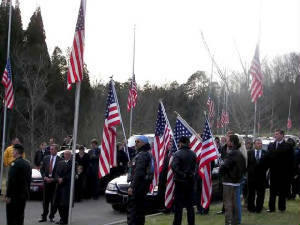 Glenn Morris, SSGT Morris' father, asked everyone to carry American flags at the burial services. "He said that the red that's in the flag is his son's blood." Romine said. "Each flag he sees brings more honor. By tomorrow there won't be a single flag left in any of the stores around here." Information for this article was taken from WATE Channel 6 News and WBIR.com. Knoxville TN. 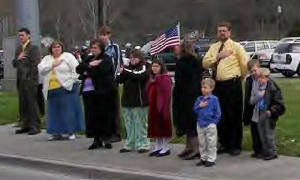 Anderson County, Tennessee residents gathered Sunday, Dec 3rd to say a final goodbye to a fallen soldier from Clinton. Hundreds of people braved the chilly weather to pay respects to 28-year-old Daniel Marshall Morris. He was a Staff Sergeant with the 1st U.S. Cavalry Division. Morris died on Nov 25th when a roadside bomb exploded near his humvee in the Diyala province located northeast of Baghdad. Two other soldiers were injured in that explosion. On Sunday, several businesses in Anderson county offered tributes to honor the fallen soldier. Other mourners made a point of saluting the funeral procession by lining the streets. The motorcade bearing Morris and his family took nearly an hour to reach the cemetery, winding past numerous crowds and patriotic displays, which lined the route. Scores of motorcyclists from the Patriot Guard Riders took part in the procession. Slowly, solemnly they came to Oak Ridge Memorial Park, a sea of red, white, and blue, to honor a man made to be military. Morris was brought to his final resting grounds in a casket draped with an American flag, carried by his brothers-in-arms. He received full military honors including a 21 gun salute, a bag piper playing Amazing Grace, and Taps. Men and women saluted, lay their hands over their hearts, some silently sobbed under the sounds of the solemn music. 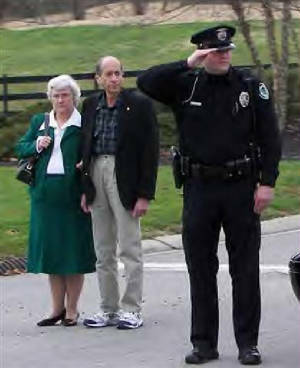 Both of Morris' parents were presented with an American flag. Staff Sergeant Morris received a soldier's welcome, a soldier's goodbye. Hundreds huddled around in complete silence. Family, friends and strangers respected Morris together and reflected on his sacrifice. Many who gathered on the cemetery grounds had never met the soldier, yet they appreciate his sacrifice. Retired Army Staff Sergeant Delious Scarbrough says he came to show respect. "He was serving his country and died for his country and this is the least we can do for him. It's the last thing we can do for him." "He gave his life so we can continue to live free. He took I feel my place. I wasn't there. He took my place and I wanted to honor him," says Valerie Widgren of Powell. "It's the hardest thing I've ever done and I've been in it for 15 years. It's the hardest thing I've done anytime you pay tribute to a fallen soldier. You never want to do one of these. You don't want to loose a soldier," Norman Bergeron with A-Company 96ASB. Scarbrough says, "I just want to let the family know we appreciate him. We appreciate his sacrifice. He won't be forgotten. Sunday left a lasting mark on those attended. Friends say Morris loved his country, his community, and his family. His father, Glenn Morris, said he is proud of his son. "I love him. I was blessed to have his presence here on earth. He's real special." Even though Staff Sergeant Morris truly believed in what he was doing in the Middle East, his family says one day he had dreams of becoming a minister. He was a faithful man, faithfully followed by many on Sunday. Morris lived at a serviceman's home operated by Rev. Matthew Reed, his friend and pastor from Ft. Hood, who came to Oak Ridge for the funeral. Morris had planned to attend his church's seminary after leaving the Army. Reed says the two often talked about the price of freedom. Morris knew freedom came with a price. Reed described Morris as a real life hero who was humble, yet courageous. "He was Clark Kent in his civilian clothes and Superman in his uniform." Four days after his death, Glenn Morris says, they got a letter from his son. It was addressed to his mother. He talked about being busy in Iraq and about helping the Iraqi people win freedom. "He had compassion for them. He was there to try to actually help them get their freedom," Morris said about his son. 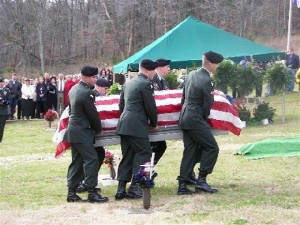 A son, a father, a hero laid to rest with full military honors. A man remembered today, remembered always. 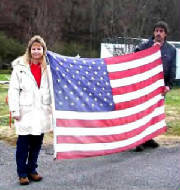 As mentioned in the articles above, The Patriot Guard Riders were in attendence at the invitation of the Morris Family. Their motto is “Standing for those who stood for us”. They strive to bring honor to our nation's fallen heros by showing sincere respect for them, their families and their communities. and to shield the morning family and friends from any possible interruptions. They are available to the family for help and support of any kind. The Patriot Guard Riders are quick to point out that other groups were in attendance also, joining together to honor SSGT Morris and his family. The included, but weren’t limited to U.S.C.A.V (United States Citizens Aiding Veterans) and the CMA Christen Ministries Association. Below are some messages that members of the Patriot Guard Riders have posted. Thank you for your willingness to defend the United States of America and her freedoms and interests. Your untimely death brings much sorrow and sadness to the hearts and lives of your family, friends, military brothers and sisters, each and every member of the Patriot Guard Riders, and all who truly appreciate their freedom. We are proud of your service and dedication in that which you believed in and fought for. Your mission is complete. You are truly an American hero and the world in which we live is a safer place because of your commitment to freedom. We will now proudly stand for you with honor, dignity, and respect. We pray that you will now rest peacefully in the arms of God. May He provide peace, comfort, and understanding to each life you touched. To the family of SSgt. Morris... What words could possibly help during a time like this… When we know not what we should pray for as we ought, the Spirit maketh intercessions for us with groanings which cannot be uttered. Romans 8:26 So let not your heart be troubled, for your loved one has gone to the place which Jesus has prepared. Stand down soldier, your mission here is complete. To the family and friends of SSgt. Morris, you have our most sincere condolences. I am truly sorry for your loss. We owe Daniel a debt of gratitude that can never be repaid for the sacrifice he has made. May we all try by honoring his memory. Thank you Daniel for your service to our country. May you rest in peace with the Lord. Standing by in Clinton, TN. Our condolences to the family of SSgt. Daniel M. Morris, may the Lord keep His Loving Arms around you in your time of grief. SSgt. Morris, Stand Down, Sir, your mission here is complete, we thank you, sir. Fly now on the wings of the Angels into the Loving Arms of our Lord. May God Bless and hold close the family of SSgt. Morris in their time of sorrow, your loved one will live on always in our hearts and homes. You are our hero SSgt. Morris and we will continue to live by your example. Sleep well you are with God now. If i live another day...it will be in honor given to the brave men and women that keeps us safe. Thank you to all of you who were part of Daniel's mission. You made a hard time more bearable and it became even more special for us. The honor and support that the small town of Clinton, TN, showed their local hero was overwhelming. A burial at Arlington National Cemetery could not have competed with what you all did for Daniel, and we'll never forget it. God bless you all! God bless our troops! God bless America! Arriving at 11:30 am there were bikes already there, by 12 noon the numbers grow.....We had 202 bikes many had extra riders and two Cages.......We started lining up in the order it was asked by the family.....each group helped me to get this all working I had great respect for all who helped me to make this a mission that the family was proud of. Laurie Kohler bought us a flag. (We Support our Troops) and all riders signed....a helmet was placed for anyone that wanted to give money, that a 10 year old little girl would have a great christmas, that filled fast....it totaled $365.00. The Family wishes me to express how honored they were for all the groups that attended. You did a fine RC job Thanks....and the PIC's here are great but, to the others that will read this here are my thoughts on what you did not see. Soldier rest in peace for you served to give us peace and freedom and as you were looking down on us that day I hope we made you proud because we are proud of you.